LANSING, Mich. (AP) — Michigan Republicans voted Tuesday to make it a crime for government agencies to require the disclosure of nonprofits’ donors and other information, a move decried by critics as shielding political “dark money” but defended by supporters as protecting people’s right to freedom of association. The GOP-controlled House approved the bill 58-51, largely on party lines. It will go to Republican Gov. 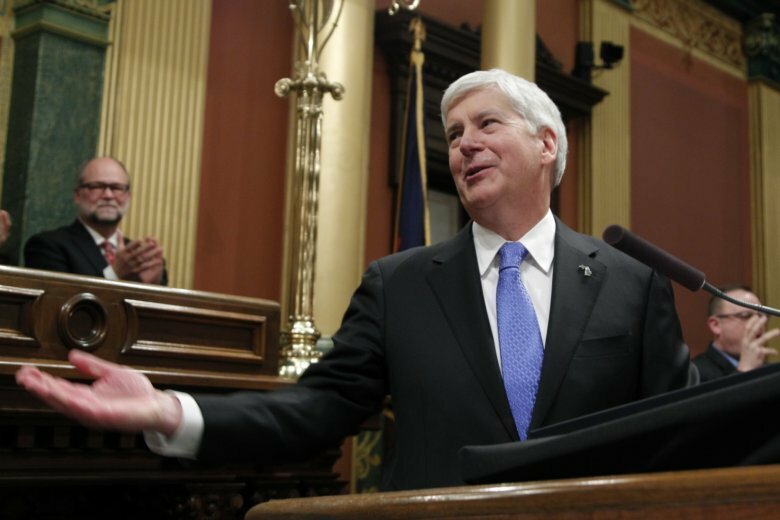 Rick Snyder following a procedural step in this final week of a frantic lame-duck session. The vote came as another contentious measure, to strip campaign finance oversight authority from Democratic Secretary of State-elect Jocelyn Benson and shift it to a new bipartisan commission, was in serious trouble. A committee agenda that was posted late Tuesday did not include the Senate-passed legislation — considered by many to be the most egregious among several GOP “power grabs” — after it drew opposition from Democrats and many Republicans in the House. Separately, GOP Sen. Mike Shirkey of Clarklake said his nonprofit bill “protects the entire breadth of nonprofits to ensure that public entities don’t with nefarious or otherwise objectives demand the disclosure” of donors. The proposed Personal Privacy Protection Act is seen by some as a pre-emptive strike against the incoming Democratic secretary of state and attorney general, who will succeed term-limited Republicans. Politically active nonprofits that spend big on elections and ballot initiatives already do not have to disclose the sources of their funding to the IRS. The bill would prohibit Michigan agencies from making such information public or even collecting it in the first place — unless there is a warrant or a request as part of litigation. “Why would we want to enshrine into law here in the state of Michigan the ability to not provide transparency surrounding individuals who are allowed to put unlimited amount of money into our political process?” said Democratic Rep. Abdullah Hammoud of Dearborn, who voted against the measure. Another opponent — Craig Mauger, executive director of the Michigan Campaign Finance Network, a watchdog group — said the bill would block any future attempts in Michigan to follow the lead of some states and require more transparency in political spending. “This bill criminalizes future efforts by a secretary of state, an attorney general, a governor, a local government that’s empowered by its voters to do anything about the anonymous money in our politics,” he said, saying experts know of no other states with such a broad law against nonprofit disclosure. Mauger said nonprofit organizations powered by anonymous funders spent $3.1 million this year to influence state Senate races. One liberal nonprofit based in Washington, D.C., spent nearly $7.9 million on ballot initiatives to overhaul redistricting, expand voting and require paid sick leave — two of which were passed by voters last month. The third was adopted by GOP lawmakers before the election before being significantly scaled back last week. Supporters of the legislation said it would codify existing practice and protections for people, and noted that the Trump administration in June stopped requiring political nonprofits to share their major donors’ names and addresses in their tax filings. “However, several states and a growing number of municipalities across the country are seeking to undermine Americans’ constitutional freedoms of speech and assembly through forced-disclosure laws and ordinances,” said David Guenthner, senior strategist for state affairs at the conservative Mackinac Center for Public Policy. The legislative session is expected to end Thursday, and several contentious bills remained on the table. One would let the full Legislature or individual chambers automatically intervene in lawsuits, a power that until now has been reserved for the state attorney general. An additional measure would make it harder to launch ballot drives, following voter approval of three Democratic-backed proposals last month. And a bill very close to Snyder’s desk would hamper the ability of Democratic Gov.-elect Gretchen Whitmer’s administration to set environmental and other regulations that are stricter than federal rules.